What is STEM? STEAM? STREAM? What is STEM? STEAM? STREAM? SHTREAM? SSTALAKTLKJTA? I'm going to start with what STEM is not. Making sure the areas of science, technology, engineering and maths are ticked off in each project. These dot points are important in learning the skills to be able to do STEM well, and also learning to use new technologies that will become more common-place, but on their own they are not doing STEM. TO ME, DOING STEM MEANS TO USE ENGINEERING DESIGN PROCESSES TO CREATE SOLUTIONS TO QUESTIONS OR PROBLEMS. So if that's what STEM is, what is STEAM or STE(A)M? I know a lot of people are going to disagree with this, but I'm going to say it anyway. In my opinion, STEAM is for people who don't know actually know what STEM is and want to seem like they're doing something more advanced. People who say they are doing STEAM, say they are also incorporating the arts. This makes me wonder if they actually know what STEM is because engineering is designing; designing involves being artistic; therefore, the arts are already included in STEM, they don't need a separate letter. My good friend and colleague, the very talented Kristen Hebden (leader of the FabLab at Lauriston Girls' School), put it much more eloquently than I did when we described that she is actually offended when people feel the need to say they're doing STEAM as it completely disregards the creativity and imagination that is inherent in all of science, technology, engineering and mathematics. For example, engineers imagine, create and design solutions to all sorts of problems. Although not all engineering solutions would be described as beautiful or aesthetically pleasing, creativity, aesthetics and imagination are all tools in an engineer's skillset. The purpose of the design process is to investigate solutions that can help - solutions could be writing a memorable jingle, developing a puppet show, creating an artwork... Hence, the 'A' in STEAM is redundant, and more importantly, if you are insisting that doing STEAM is something different to doing STEM, you're missing the whole point of STEM. But what about STREAM, STRREAM, SHTREAM...? SHTREAM apparently incorporates science, humanities, technologies, reading (wRiting, religion), engineering, arts and mathematics. I'm not actually joking that this exists. I've seen it, and gosh was it a shambles! If you are doing STEM as per our definition, I believe all areas of knowledge are being incorporated and hence the name might actually be irrelevant (see below). Kristen once said to me that she's trying to move away from the label of STEM (partly because of the issues associated with the common use of STEAM) and more to talking about design thinking instead. I like where she's going with this. But the humanities are important too! Why just focus on STEM!?!?! Let's say we're trying to find some solutions to reduce the amount of rubbish that occurs on a community beach. If we start with the define step of the engineering design cycle, we have to figure out why the rubbish is there in the first place. This involves research, investigation and observation. It involves communication, psychology and sociology. It includes analysis, calculations and using various technologies to collect and understand data - and remember any tool is a piece of technology, including a pencil. We have to understand our findings within the particular social, political and environmental context they were researched in. At this point, we haven't even got past the design step and I feel like I've included most areas of knowledge. The bottom line: why do STEM at school? STEM has different meanings in different contexts. 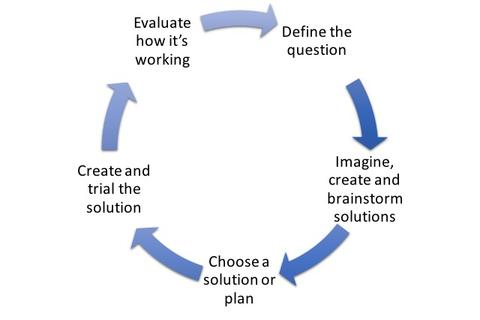 In schools, doing STEM is a way of thinking and doing - it is following the engineering design process of designing, creating and evaluating solutions to problems and questions and then doing it all again. In their lives, our students are going to be faced with increasingly complex problems. They will need to use the skills they've developed through STEM design thinking to tackle this problems and create unique, and probably complex, solutions. Coming up: how to do STEM in schools, the STEM pipeline, tertiary STEM subjects and careers, assessing STEM, recommended technologies for doing STEM, STEM in the home, and many more! *My understanding of what STEM is comes from working as a teacher, a scientist, being part of engineering research groups and undertaking a PhD in STEM education. It also comes from reading the research literature around STEM education. I'll admit that there is no one right answer to the question "what is STEM" but I aim to define it to enable teachers to do something with it that is useful for students. In a later post, I might write a referenced history of STEM education, but for now this will have to do.